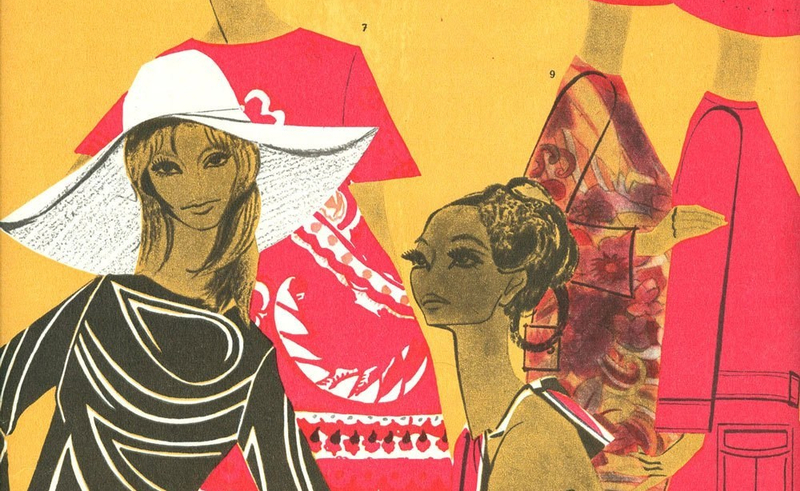 Estonia’s second-hand bookshops throw up no end of exciting discoveries, one of which is the abundance of back issues of Soviet-era fashion magazine Siluett. Iconic, visually seductive, ground-breaking but also homely and practical, Siluett kept its Estonian readers at the forefront of global fashion for well over thirty years. Launched in 1958 by the Tallinn Fashion House, Siluett was arguably the one truly agenda-setting fashion magazine the Soviet Union produced. Avidly read throughout the union, it was published in both the Estonian and Russian languages at its peak. Siluett was launched at a time when the Soviet Union was keen to improve the production of consumer goods and pay more attention to the life and leisure time of the individual citizen. That it appeared in the Estonian capital Tallinn rather than Moscow or St Petersburg was no accident. Estonia was considered to be one of the most westernized parts of the Soviet Union, a Nordic country that had ended up on the wrong side of the Cold War divide. Tallinn was also sufficiently far enough away from the Soviet mainstream to allow relatively liberated experiments in popular culture to take place. In one sense Siluett served the Soviet regime’s purpose by demonstrating that the USSR was capable of matching the west in terms of style and modernity. However it was also an opportunity for Estonians to carve out a corner of national self-respect by demonstrating how far in advance of Moscow their art-and-design capabilities really were. Aside from the “Around the World” section inside the back cover, which republished photographs culled from Vogue and other Western magazines, the content of Siluett was almost entirely home-generated. Estonian models were shot in Estonian locations, giving the Baltic state a glamorous contemporary sheen. Estonian graphic artists provided the ravishing colour spreads. Although many of the designs in Siluett were adaptations of western styles, there were also attempts to develop ideas that drew their inspiration from local folk attire – another sign that the subtle but unmistakable Estonian-ness of the magazine was a key ingredient of its appeal. The magazine was almost totally devoted to the art of clothing; aside from a sprinkling of articles delivering practical make-up tips (and seasonal advice on how to get your body in shape for the beach), there was no attempt to become a general interest magazine by including articles on cooking, celebrities or household makeovers. It was a singularity of purpose that helped maintain Siluett’s unique position in the publishing world. At its peak, the magazine’s Estonian edition had a print run of 50,000; while the Russian-language version ran to some 320,000-350,000 copies. Indeed there was suspicion that Siluett’s circulation was deliberately capped by the authorities, in the Moscow-centric belief that its main Russian rival Moda should be allowed a wider public reach. When the Soviet Union collapsed the magazine was shorn of funds and quietly disappeared – unaware of its latent potential as a leading Estonian brand. Siluett’s creative peak was in the Sixties, a decade when anything seemed possible and progress was taken for granted. Copies of the magazine in the Seventies reveal muddy layouts, bad-quality colour printing, and increasingly conservative attitudes to design. Maybe the very fact of the magazine’s pan-Soviet popularity had blunted its original Nordic sense of focus.